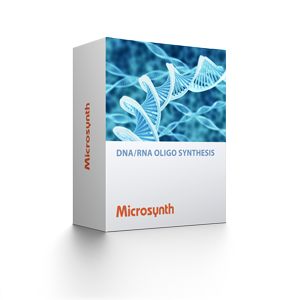 Microsynth uses proprietary synthesizer technologies to offer oligonucleotides of highest quality. Our state-of-the-art production facilities enable fast synthesis of standard primers, modified and functionalized oligonucleotides as well as (dual-) labelled probes. You benefit from a comprehensive variety of modifications, different quality levels and final preparation options. Trained scientists with molecular biology background are happy to support you (from 8 am to 5 pm)! Microsynth is offering its DNA oligos at 5 different scales. For large scale synthesis please get in contact with our experts. 2 Our guaranteed and average yields are measured in OD and are valid only for unmodified oligos >20mer. Microsynth is continuously expanding its portfolio of dyes which can be used as cost-effective alternatives to patent-protected dyes. If your desired modification is not listed please contact us for availability. To obtain information about our prices, please login to our webshop and download the current price list or ask your sales manager for a specific quote (attractive discounts are available if you plan to order more regularly from Microsynth or if you have a volume order).